Greensboro, N.C. (Aug. 31, 2018) – To much anticipation, the Student Government Association and the Student University Activities Board at North Carolina Agricultural and Technical State University has announced the much-anticipated line up for the 2018 edition of The Greatest Homecoming on Earth, Oct. 28-Nov.4. The eight-day celebration includes the comedy show, “We Got Next,” featuring Deon Cole from the hit television show, “Blackish,” as the headliner. Social media comedic phenoms Jess Hilarious and Donnivin Jordan will round out the ticket. This year’s step show, “The Battle and the Blowout” has an added twist with the addition of a band showcase with N.C. A&T’s famous Blue and Gold Marching Machine and Norfolk State University’s Spartan Legion. 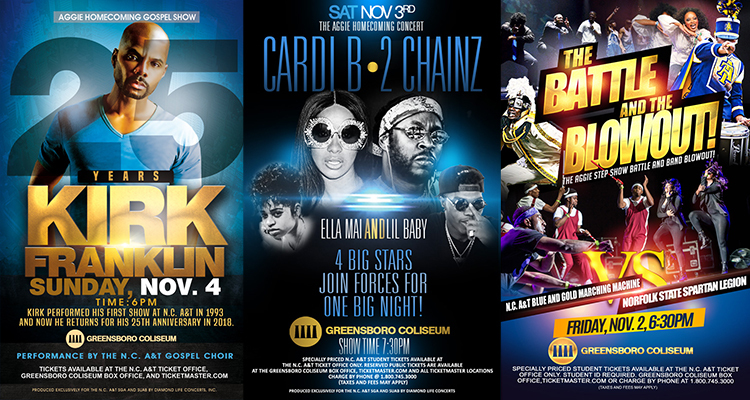 Following the homecoming game, music fans can look forward to the official Aggie Homecoming Concert featuring Cardi B and 2 Chainz with Ella Mai and Lil’ Baby. Returning to A&T 25 years after his first campus concert, gospel artist Kirk Franklin will headline the Aggie Homecoming Gospel Show. The concert will also feature a performance by the award-winning North Carolina A&T Gospel Choir. Specially-priced student tickets for each event are available at the University Ticket Office located in Brown Hall or online at www.ncataggies.com. Student IDs are required. General admission tickets are available at the Greensboro Coliseum Box office and www.ticketmaster.com. Wednesday, Oct. 31, 8 p.m.
Sunday, Nov. 4, 6 p.m.